The new Bolt Biter extraction sockets form Gearwrench are designed to remove weathered, damaged or rounded fasteners. Utilizing tapered internal flutes and featuring bi-directional functioning, the sockets are able to be disengaged from damaged fasteners without hammering or destroying the fastener. SPARKS, Md., Oct. 29, 2018 /PRNewswire/ -- Tradesmen don't like to be slowed down by anything, and that goes especially for old worn fasteners. Difficulty removing, weathered, rounded or damaged fasteners can keep techs from moving on to the next phase of a job, costing time and money. GEARWRENCH®, a premier manufacturer of hand tools within the Apex Tool Group, developed its new Bolt Biter™ Extraction Sockets to provide an uncommonly simple solution to this common problem. The socket is simply placed onto the rounded fastener; no hammering onto the fastener is needed. It is much easier to disengage the socket from the fastener once the fastener is removed. The fastener is not destroyed during the process and can be re-installed using the same Bolt Biter socket, especially important if the fastener is a non-standard part. Bi-directional design which allows for user to not only remove a damaged, rounded or weathered fastener, but also reuse it. Bolt Biter Extraction Sockets have up to ten times the useable life of cutting-type extraction sockets, which quickly become dull and unusable. "Tool users will tell you the thing they can't stand the most is losing time when a tool can't get the job done. If time lost is money lost, then time saved is money in your pocket, and that's what the Bolt Biter Extraction Sockets are designed to do better than any other on the market," said GEARWRENCH Product Manager Jarrett Wolf. "These sockets address the biggest needs out there while providing a level of durability not typically associated with extraction tools." Bolt Biter Extraction Sockets can be used with both hand and power tools. They incorporate a square drive with a hex outer shape for easy use with an impact gun, ratchet, wrench or pliers. 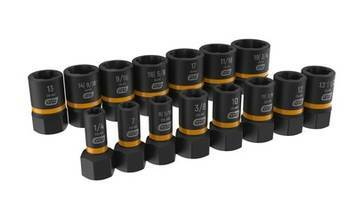 GEARWRENCH Bolt Biter Extraction Sockets will be available individually and in 8, 15 or 28-piece sets beginning in early 2019.